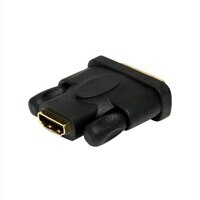 HDMI Female to DVI-D Male Video Cable AdapterOnly high-quality components are used when StarTech.com's manufacturing team creates cable supplies and this adapter is no different. These cables help StarTech.com maintain its tradition of offering excellent parts and products. Only high-quality components are used when StarTech.com's manufacturing team creates cable supplies and this adapter is no different. These cables help StarTech.com maintain its tradition of offering excellent parts and products.